As a partner in education with Randolph Technical Center, Staff Sgt Travis Mitchell, back row, conducted a culinary lesson with students enrolled in ProStart, a culinary program for high school students. Recipes for corn tortilla chips and white cheese dip were prepared by Robyn Smith, Nicole Bosserman, Instructor Frankie Lucas, Kyrsten Spencer and Tara Marstiller. Staff Sgt. Travis Mitchell knows his way around a kitchen, and he proved that recently during a visit to Randolph Technical Center in Elkins, West Virginia, where he served up a cooking lesson for students in the Advanced Principles of Food Production class. Mitchell’s time behind the line began while studying culinary arts in his native Virginia, followed by a stint as a cook before enlisting in the U.S. Army Reserve more than 20 years ago. He later served as a cook in the Army for six years before becoming a recruiter. Mitchell is certified in ServSafe by the National Restaurant Association, as is class instructor Frankie Lucas, who organized the visit. Students learned to make corn tortilla chips and queso blanco, a Mexican white cheese dip. 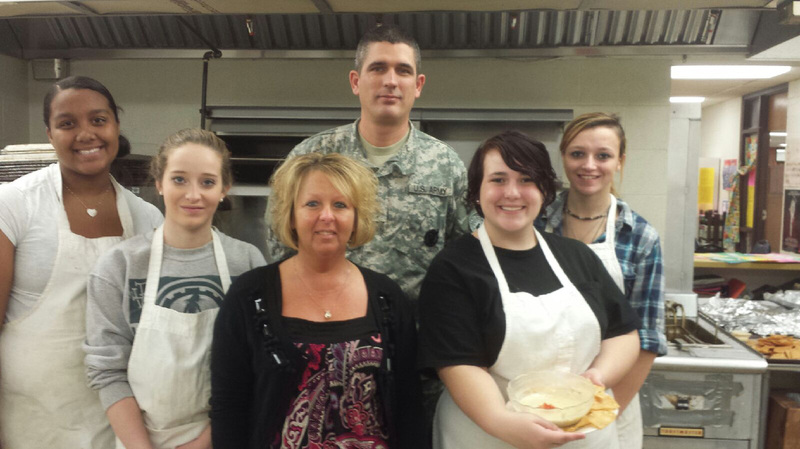 Mitchell took the opportunity to discuss career opportunities in the Army with the students while they prepared the food.